This webapplication solves Linear Programming problems using the Simplex method and offers handy input formats for a Transportation problem*, a Network problem*, and a generic LP problem. Soft limit: solving a transportation problem with 2500 decision variables takes approx. 30 seconds, with 5000 decision variables approx. 4 minutes. * Input is automatically transformed into Simplex tableau format. You can define a netwok consisting of nodes and arcs. The decision variables in this type of problem are the arc quantities. Each arc has costs per quantity, a lowerbound (minimum flow quantity) and upperbound (maximum flow quantity). Nodes also have costs. They can be related to incoming quantities - those are effectively added to the arc costs of all incoming arcs of this node. They can also be related to outgoing quantities, added to outgoing arcs costs. 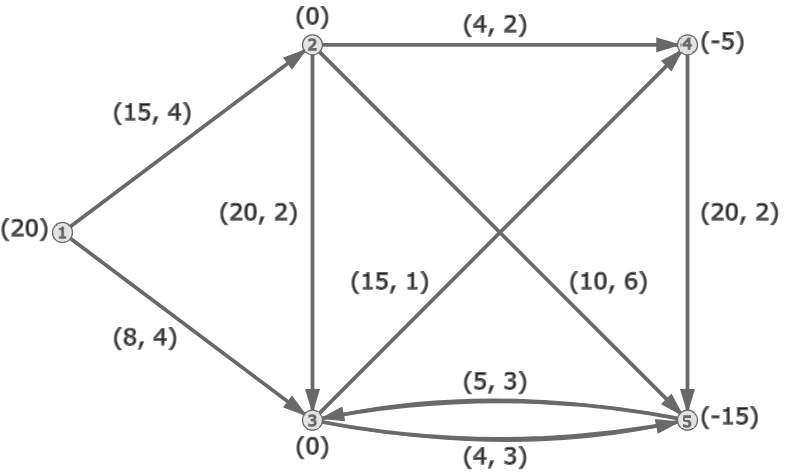 Nodes can also have upperbound and lowerbounds that relate to troughput (incoming quantities). By adding dummy nodes and arcs (with zero costs) you can create completely balanced systems and/or make a model better 'readible'. This type of model can also be used to model transitions in time, with an arc representing a transition from time to time+1. Do not enter slack variables: those are created automatically! Putting the demo case table next to this Simplex tableau you will recognize figures. Note that instead of Xrc (20 rows × 10 columns) all has been translated into Xj (200 variables sitting on a single row), so Xr=6,c=3 has become X53 that has a value of 16 in the optimal solution.